Recently I had to solve the same, rather complex, problem for three different customers within the space of two weeks, a variation of the ‘events-in-progress’ problem I’ve blogged about a lot in the past. It’s this one: how can you calculate the value of your overdue invoices on any given date? It’s important to stress that we are not talking about the invoices that are overdue today – we want to be able to pick any date in the past and find out the value of invoices that were overdue at that point in time. Looking at the rows highlighted for invoice 5, you can see in the upper box that there is a positive amount of £35 shown on January 1st 2014 – this is the date that the invoice was opened, and £35 is the full value of the invoice. The invoice is due on January 10th 2014. In the lower box you can see there were four separate payments of £5, £5, £10 and £15 before the invoice was fully paid off on January 12th 2014. 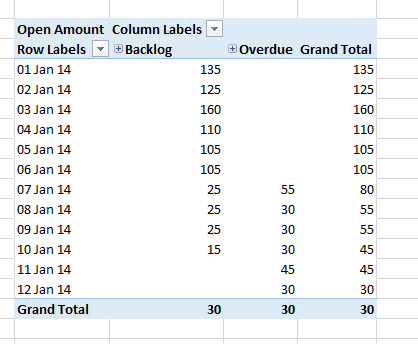 One way of solving this problem would be to calculate the overdue and backlog values for each date that each invoice is open in your ETL, and store these values in a snapshot fact table. This works, and will give you the best possible query performance, but it has two major drawbacks: first, it makes your ETL much slower, and second it makes your fact table much larger. 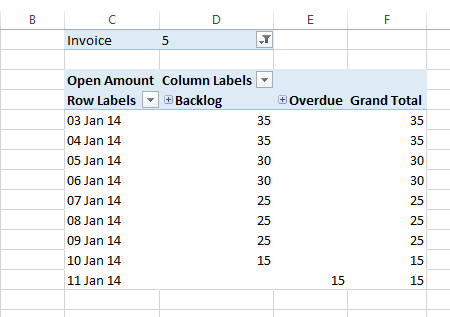 This post describes how you can calculate the overdue and non-overdue values on any given date using many-to-many relationships instead, without having to blow out the fact table. … and an invoice dimension table that just contains the distinct invoice numbers called DimInvoice. Now, let me explain how to build the SSAS cube. 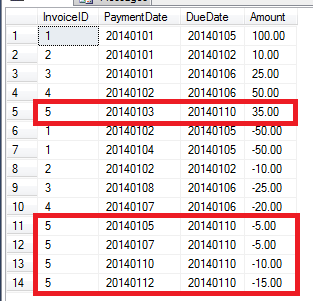 Build dimensions from all of the tables shown above, so you have dimensions called Date, Overdue Days and Invoice. Build a cube with one measure group, based on FactInvoice, and create one measure with AggregateFunction Sum based on the Amount column in that table. 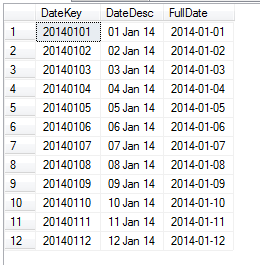 This view returns all of the combinations of a given date and all dates up to and including the date. Add this view to the DSV and create a new measure group from it; you’ll need to create a measure here, but it can just be a Count measure. Add the Date dimension to the cube once again, this time leaving the name as Date (you will now have three role-playing copies of the Date dimension in the cube). Yes, I am cross joining the DimDate table with itself and yes, this could return a lot of rows. However you should find that the view is very fast to execute. Add this view to the DSV and build another measure group from it, again with a single Count measure on it. 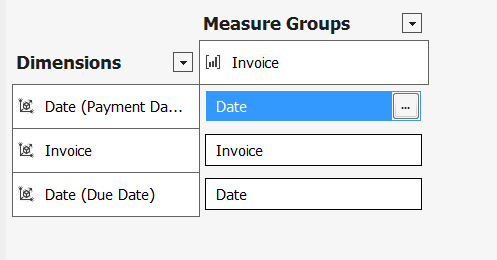 Set up a regular relationship between this new measure group and the Due Date dimension. Add the Overdue Days dimension to the cube, give it a regular relationship with the new measure group and a many-to-many relationship with the Invoice measure group through the new measure group. The purpose of this measure group is this: if you select a date on the As Of Date dimension, you will be able to select ‘Overdue’ on the Overdue Days dimension and this will give you all of the dates on Due Date that were overdue on that date. This is a very complex pattern, I know, and this is after I’ve simplified it a lot (if you need currency conversion as well then things get even worse) but I also know it’s extremely useful from a business point of view. Query performance is also reasonably good, at least in the places where I have implemented this. You can download my sample SQL Server database and VS 2012 project here. 21:40 – a nice shot of one of the new Power BI dashboards first announced at the PASS BA Conference earlier this year. You can see several new types of visualisation such as treemaps, radar charts and gauges (gauges? GAUGES? Shhh, don’t tell Stephen Few). 22:33 – a list of out-of-the box data sources is shown from which new models can be created. They include: Salesforce, MS Dynamics, Facebook, Google Analytics, Twitter, and Upload Excel. 22:50 – data is imported from Salesforce in the browser. This isn’t happening in Excel on the desktop, folks, it’s in the browser. This is significant! 23:10 – another new visualisation shown, a doughnut chart (if that’s the right term). I see names of people from the Power Query team in the data. 25:55 – “Partner Solution Packs” are announced. This sounds important! It seems to be referring to the Salesforce demo earlier, and these solution packs are said to include: data, connectivity to the data sources, visualisation and interactive reports. So it sounds like Microsoft are going to encourage data vendors (or other sources of data) to build these solution packs on top of Power BI as pre-packaged analytical apps. Probably a good idea. 26:15 – editing a dashboard in the browser and swapping one visualisation for another. Again, the HTML 5 browser based editing experience – we haven’t seen Excel once in this demo. 27:55 – “If there was ever a partner opportunity, this is it”. Again much emphasis here. Seems like these new Power BI features, especially the solution packs, are aimed at giving partners incentives to sell and customise Power BI (something which they have not had up to now, to be honest). Oh, and you probably already heard that Azure Machine Learning is now in public preview. Check out the docs and samples here. I wouldn’t be surprised if there was some integration between this and Power BI to come too. What does the Unorder() function do? It’s a function that takes a set and returns a set, and what it does is remove any implicit ordering from that set. By default all sets in MDX are ordered, but for some types of operation that ordering is unimportant and ignoring it can result in faster query performance. As far as I can tell, Unorder() only makes a difference on calculations when used in combination with NonEmpty(), and when it is used over a large set (here the set of customers has around 18000 members). If you have calculations like this I would recommend testing to see if Unorder() makes a difference – if it does, please leave a comment and let me know what you find!